The Delta Flight Museum welcomes the public to explore aviation history, celebrate Delta’s story and people, and discover the future of flight. Located in Delta’s original 1940s-era aircraft hangars in Atlanta, the museum was founded in 1995 and completed a major renovation in 2014. The 68,000-square-foot attraction serves as exhibit, archive, and collections space, and the hangar can also be rented for special events. Historic aircraft are on display, along with exhibits that tell Delta’s story. In addition to the public display area, the museum also includes a climate-controlled collections area fitted with Spacesaver compactors and cabinets that keep objects secure, organized, and easily accessible. 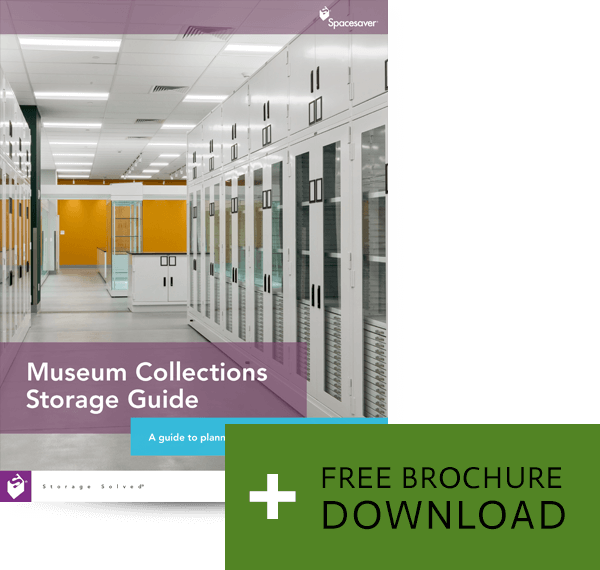 Like many museums, most corporate museums are continually expanding their collections and a fraction of any collection is on public display at any given time. Collections storage was a challenge for the Delta Flight Museum, and the museum’s curator and preservation staff wanted to create a better solution to keep collections accessible and organized. The collections area was housed in a former maintenance operations area consisting of several small rooms. Even with the non-load-bearing walls removed, the resulting space was somewhat odd, with several doors leading into the collections area and a variety of overhead pipes and large structural columns intruding into the space. While the system was designed to protect the past, the collections area also has room to grow in the future. At her prior position at the Georgia Archives, Seetoo observed how that institution installed the in-floor rail system before additional carriages and storage furniture were needed or purchased. By planning ahead and installing the rails during construction or renovations, museums can be ready to accept new carriages as collections grow. Seetoo convinced her colleagues to pursue this strategy, and in 2017 an additional carriage was installed in the area. 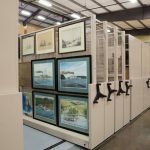 Spacesaver’s network of local distributors can help out with all aspects of corporate museum storage system planning, installation, and maintenance. We pride ourselves on building long-lasting personal relationships with our clients and our commitment to service extends long after the sale. Contact us today to connect with your local Spacesaver representative.